Chester Alan Arthur was born October 5, 1830, in Fairfield, Vermont. He achieved prominence as a politician and as president of the United States. An 1848 graduate of Union College, Arthur was admitted to the New York City bar in 1851, and he established a legal practice in New York City that same year. "Men may die, but the fabric of free institutions remains unshaken." With the onset of the Civil War, Arthur served as quartermaster general and inspector general of New York. After the war, from 1871 to 1878, he performed the duties of collector for the Port of New York. Although Arthur was a believer in the spoils system, a practice that rewards loyal political party members with jobs that require official appointment, he served his office as an honest administrator. President rutherford b. hayes was, however, an advocate of the civil service system, which provided that qualified people receive employment fairly based upon their qualifications, and removed Arthur from the office of collector. 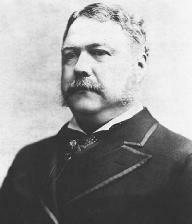 Arthur returned to politics with his election as vice president of the United States in March of 1880. In September 1881, he assumed the duties of president, after the assassination of President james garfield. As president, Arthur advocated the passage of the Pendleton Civil Service Reform Bill in 1883, adopting a view that was contrary to his previous support of the spoils system. He also signed laws allowing for the modernization of the United States Navy and supported the prosecution of the Star Route Trials, which exposed fraudulent activities in the United States Post Office Department. He also vetoed a Congressional bill, the Rivers and Harbours Bill of 1882, charging that the allotment of funds was too extravagant. Arthur's presidential term ended in 1885; due to ill health, he did not seek renomination. He died November 18, 1886, in New York, New York.